One of the most fascinating current phenomena is the effect that the venture capital market has on the economy as a whole. As Bill Gurley noted at a recent Goldman Sachs technology conference, “FOMO” in the private markets is fueling valuations. As companies evaluate the tradeoffs of staying private to protect their business focus or making a public offering of shares, funds of all shapes and sizes are causing hysteria, in a sense, with their insatiable desire to invest in established and even nascent technologies in attempts to not miss out. It is now commonplace for hedge funds to have a parallel vehicle to invest in startups and even mutual funds are attempting to get in on the action. Plenty of capital already pursues companies with moderate ambitions and a lower perceived degree of risk. This tends to push up valuations for those companies and correspondingly depress returns—which, of course, increases overall portfolio risk. Venture capital served a noble and absolutely necessary purpose from 1960-1990, where transformational technologies were being funded. But VC has ceased to be the funder of the future, and instead has become a funder of features, widgets and irrelevances. As Peter Thiel stated, the shift away from backing transformational technologies and toward more cynical, incrementalist investments broke venture capital. VC used to fund technologies for a better future, with patience. Now, VCs want to invest in underdeveloped and unambitious ideas for shorter periods and are essentially replicating the ‘90s model, which worked for a brief period, thanks to an enormous stock market bubble. It was actually reasonable for VCs to fund these ultimately worthless companies because they produced extraordinary returns—in fact, the best returns in the industry’s history. And there were subsequent bubbles—acquisition bubbles, secondary market, etc.—which have continued to generate excellent returns for VCs lucky enough to tap into them. Whatever the bottom 80% of the VC industry is doing now is losing money for investors. Clearly, the mainstream VC model does not work very well. These are consensus investments, following the herd into incrementalist technologies and bleeding the market dry. One rather important note is that the tech bubble of 2000 was essentially a public stock bubble, whereas today’s bubble is in the private realm. The key difference here is liquidity. In 2000, investors who sniffed early signs of fears could offload at least some of their exposure, but one of the main features of a private investment is the duration of its holding and lack of liquidity. VCs who have made recent investments with valuations being set forth in a competitive environment could face difficulty exiting those investments down the road with an entirely different landscape. The most common high-yielding exit is through and IPO. It is not to say that these companies could not deliver on a quarterly basis, but startup culture simply is incongruent with the public market dynamics. With such intense demand for a spot at the table, there is only one way for valuations to go. We all know what happens on the mountain when you go for one last run. This is not to say that every one of these managers carry risky portfolios, but it is rather obvious that most GPs have forgotten the VC adage; each investment must have the capacity to return the entire portfolio. The larger valuations that come to mind in the past couple of years are being offset by smaller deal sizes which carry the vast majority of the distribution. The point here is that the simple charts can be misleading if the whole story behind the data is not clear, leading to confusion about the state of the VC market. 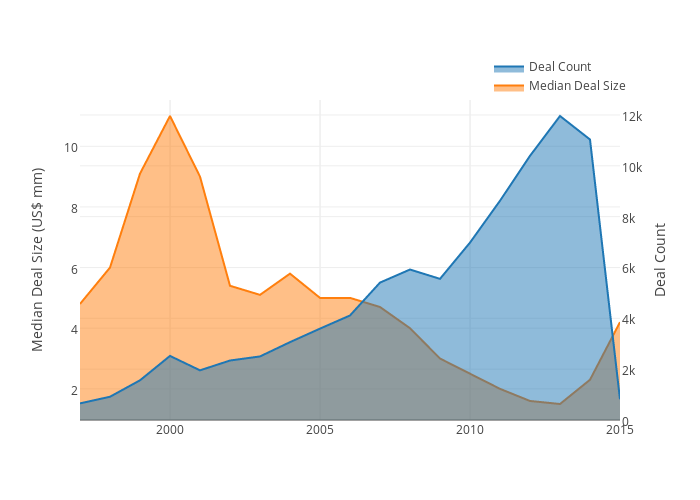 There has been a dearth of IPOs in recent years. This has led to widespread complaints among public-market investors that there’s nothing exciting to invest in anymore. It has also led to a much broader development of the private markets for hot emerging technology companies. As a result, investors who can invest via these private markets have cashed in, while public-market investors have missed out. Meanwhile, the companies that do go public are already so big and highly valued that there’s often not much upside left. So, why is it that companies don’t go public anymore? Well, for one thing, there’s the cost. Thanks to the massive regulatory burden the country now places on public companies, it costs at least $5 million a year to be public. What small company in its right mind would want to pay that? Then, for another thing, there’s the enormous hassle and legal risk. Groupon went public at the end of 2011. The company is only seven years old and it’s expanding into many new business lines, so it’s still learning as it goes. One of the things Groupon learned is that the new high-ticket items it is selling have a higher return rate than the lower-ticket items. This realization forced Groupon to restate its Q4 2011 earnings just a few months after going public. The accounting issue increased the company’s losses in the fourth quarter to $64.9 million from $42.3 million. Shares of Groupon were then trading more than 30 percent lower since the company went public in the fall. If Fab.com has taught us anything, it is that failure should actually mean failure. Investors, who tend to view startup “failure” as a virtue, completely ignore the reasons for the failure including whether it is a trait of the founder themselves. Unfortunately for Fab.com investors who failed to see this coming, this was not the first time Jason Goldberg has run a company into the ground, burning $325 million of investor money this time. But as a VC, do you move to change management in your portfolio company? When investing in a start-up, you invest in people who have the vision and flexibility to create a success. It therefore makes no sense to destroy the asset you just bought. Founder character traits are every bit as qualitative to success as the business itself and as an investor, you want your capital to fuel the company, not the founder’s ego. Bill Gates once noted how pathetic VC hit rates are. Given the volume and the risky nature of the common investment in moonshots, it is hardly a surprise that the hit rates maintain low. Failures abound in startups mainly because new companies have ambitious goals to change the world in some way, and that proves to be a very difficult task. If a startup that was experiencing growing pains was also tasked with dancing to analysts’ predictions every three months, they could not focus on their core business objectives. One way to track the private market hysteria is to look at IPO performance. 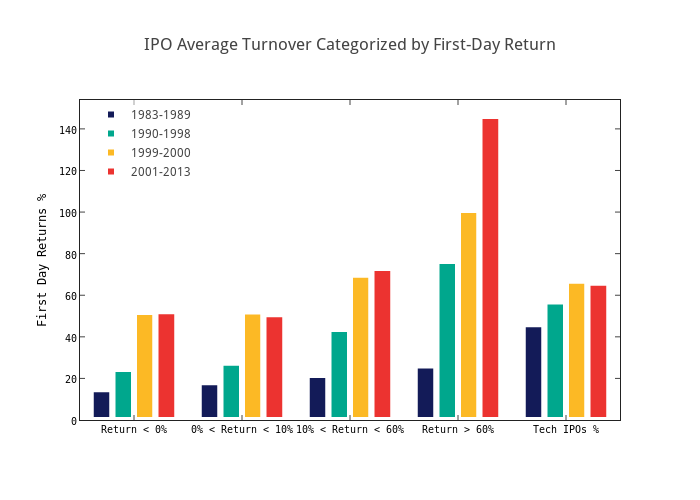 IPOs have been in high demand in recent years due to their high average rate of returns. The important takeaway is that these returns are only the first day returns and not an extended investment holding period. This is essentially a hedge fund trading strategy, that aims to take advantage of pricing and information flow inefficiencies from the underwriters. With the influx of capital fueling valuations on the private market side, investors have little to look forward to when (if) the company does go public. The private market is a very relationship-driven environment where investors make deliberate investments. In contrast, the public markets are subject to noise due to traders (human or artificial) and the intraday news reactions. Public stocks are subject to being targets of arbitrary allocation fulfillments that can artificially alter the value of the company. The last few years have offered the perfect environment for start-ups to realize their full potential with easy monetary policy leading to cheap debt, welcoming public markets for offerings and large companies seeking acquisitions; it has simply never looked better for late-stage start-ups. There has even been a massive influx into a frothy area of the private markets known as “growth equity,” a hybrid between VC and PE for later stage private companies with exits in the near future. It is no surprise that companies are acquiring at a faster rate than ever. Borrowing from Yahoo!’s famous business model of acquiring their way to innovation, many companies are too large to innovate organically but have the balance sheet to effectively grow their businesses by shopping for smaller ones on the cusp of innovation. This trend is likely to continue until the market contracts and offers less opportunity on both ends of the spectrum. For now, founders of all shapes and sizes from flower delivery apps to bioinformatics ventures will continue to receive the capital they need to deploy their products and grow their business, and that is a beautiful thing—until the market calls out the phonies and we inevitably head for a sea change in innovation.